On Tuesday, June 26, officials from Columbus State Community College, Gilbane Building Company and the City of Columbus came together to celebrate the official groundbreaking for the new School of Hospitality Management and Culinary Arts located on Columbus State’s campus in the heart of downtown Columbus. The new three-story, 77,000 SF signature building will act as a symbolic front door to the college’s campus and replace the current outdated space. The building will feature multi-purpose academic classrooms and labs, cooking and baking kitchens, faculty offices and 25,000 SF of general office space and conference rooms to support community partnership opportunities. The program will also include exterior dining areas, green space and a full-service restaurant. The school’s culinary program is ranked as one of the Top 20 in the United States and the additional space will allow Columbus State to achieve their goal of doubling program enrollment. Gilbane is providing construction management at-risk services for the new building, and project completion is set for Fall 2019. Gilbane provides a full slate of construction and facilities-related services – from pre-construction planning and integrated consulting capabilities to comprehensive construction management, general contracting, design-build and facility management services – for clients across various markets. Founded in 1873 and still a privately held, family-owned company, Gilbane has 46 office locations worldwide. For more information, visit http://www.gilbaneco.com. 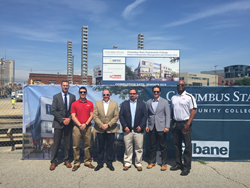 Gilbane has been providing construction management services in Ohio since 1959.